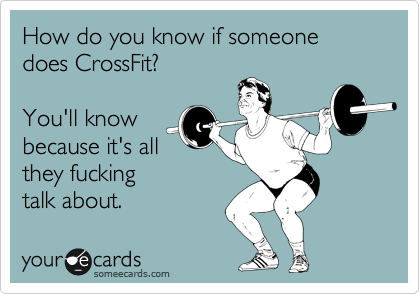 I was going to hold off on posting about CrossFit until the Open was over. N took some photos of the WOD on Sunday and I’m trying not to come off as too CrossFit obsessed (although I am, I know). Open workout 13.5 was announced last night though and I did it tonight. One of the movements is Chest to Bar Pull Ups. I’ve never attempted a Chest to Bar Pull Up. I currently can do strict pull ups, but I haven’t figured out kipping and I definitely haven’t figured out Butterflies. Since I didn’t have time to learn either of these things tonight before attempting 13.5, I did whatever I could to get my chest up to the bar, as many times as possible. This mostly involved a lot of leg swing, hip drive, and sheer determination. We all had a pretty good laugh about my “technique” (or lack-there-of) afterwards. So now there are kipping pull ups, butterfly pull ups, and my method: Alanna pull ups. I got one of the coaches to video an example of what this looks like so I could share. Enjoy, have a laugh, and, if you’re doing 13.5, GOOD LUCK! One day I really do want to try cross fit! You make it sound so fun!! Good work on entering the crossfit open lady! You should! I really like it. Sometimes it's pretty painful, but I always feel great afterwards and I love being able to see how much I improve! Thanks, I'm pretty happy with the decision! my thoughts in getting my thoughts out. I truly do enjoy writing however it just seems like the first 10 to 15 minutes are wasted simply just trying to figure out how to begin. Hi! Sorry it took me so long to reply. It looks like your comment got lost in my spam folder since it was sent anonymously. Anyway, I think the biggest thing is to just start writing. I used to spent a lot of time worrying about my grammar and whether I was being clear and cohesive, but this isn't a school writing assignment. Yes, grammar is important, but if it's stopping you from writing, then it defeats the purpose. That's what first drafts are for. I usually just start writing whatever comes out. I then step away from it for a bit and go back and edit what I've written. It seems to help. You can always leave those as drafts. I also have a blogger app on my phone. Sometimes, I'm walking home and I come up with something I think would sound great in a blog post, so I write it down. I tend to do my best writing while I'm walking. Again, sometimes it turns into something I can use and sometimes it remains a draft. Hope it helps! Best of luck!